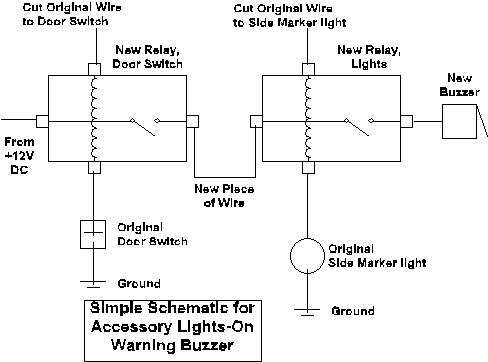 Here's a simple schematic for a warning buzzer that will sound if you've left your lights on. I'm afraid I can't remember where I found it, but if you've got a few spare relays and are handy with a soldering iron you shouldn't have much trouble figuring it out. Note that only later MGBs have door switches. See Joshua's comment below for more info. Comments on "Lights Warning Buzzer"
Skye, thanks for the idea. I removed the seatbelt safety systems from my 1974 1/2 MGB so I was able to take advantage of the extra, blue, driver's side door switch to provide current to the buzzer when the marker-light relay is thrown. In fact, I was able to take advantage of the always-on-when-ignition-off slate colored wire off the ignition (for the anti run-on valve). I ran the market-light wire from the fuseblock red-wire terminal set, and spliced another jumper to the anti run-on valve wire. Now, the buzzer sounds if the lights are on, the door is open, and the ignition is off!